In the natural hair community, there are two streams of thought when it comes to “going natural” – the big chop, and transitioning. I’m sure you already know about the big chop, which involves lopping off all of your hair into a short cut and growing it out. Transitioning is well, a gradual transition to going natural. So what does that mean, exactly? It means that in pursuit of natural hair, you make the conscious decision to stop the practices that got your hair in the position it’s currently in. So if relaxer damage has your hair looking thin and brittle, you stop relaxing. If you have heat damage, you stop frying your hair with the flat iron. If you have color damage, you let go of the hair dye to get your hair back to optimal health. When you transition, you coddle along your tresses, both natural and damaged, growing out your hair until you are ready to cut the ends off. Transitioners enjoy the benefit of added length for styles, and avoiding those awkward growth stages that can frustrate many big choppers. Whether to chop or transition is a decision of a very personal nature – and totally depends on your preferences, comfort level, and the condition of your hair. If you are used to having longer hair, chopping may be too traumatic and could inadvertently lead you to returning to straight hair. On the other hand, if you’re used to experimenting with your hair, and openly welcome change – chopping could be for you. If your hair is falling out faster than you can pick it out of the comb, you may not want to transition – some situations may be too severe for you to continue to hold on to your hair. Use descretion when deciding. 21 Months + Big Chop - Coming Soon! As far as relaxed hair is concerned, the transition looks a little different. While relaxed, many women “stretch” the periods between touch-ups, effectively growing out their roots. This is essentially the premise of transitioning from a relaxer. The only difference is, the stretch is indefinite. There is no relaxer touch-up. The new natural hair just keeps growing, and growing, until you’re ready to rid yourself of relaxed ends. Relaxed ladies, throw away the creamy crack. Don’t stash it, lock it away, or ask someone to hold it for you. Chuck it. There will be days when you feel like going back – so don’t make the mistake of leaving a tempting tub of relaxer around. Heat damage sufferers, you don’t have to throw away your tools (unless it’s time – but we’ll get to that later), but they do need to be stashed out of sight. If you can find someone to hold on to them for you, that’s even better. During the first 3 months, my sister needed to borrow my flat irons, and I just left them with her the entire time. Even if I wanted to straighten, I’d have to go all the way to her house (traffic and parking were terrible), and that effort required alone was enough to derail that pursuit. If you’re just starting out, focus on practices, not products. Make the necessary changes and get the right tools that will serve you better in the long run. Trust me. Product will ALWAYS be there. Now is the time to purchase a satin pillowcase, scarf, and bonnet. Now is the time to learn how to properly moisturize and seal your hair. Now is the time to clean house, and get rid of products that will no longer serve your hair. Learn whether you can wet, dry, or damp detangle, and if fingers or a wide-tooth comb serves you better. TREAT THE LINE OF DEMARCATION LIKE IT IS HAIR ATTACHED TO A NEWBORN BABY YOU’RE TRYING TO NOT WAKE UP. That may seem a little extreme, but I am so serious. The line of demarcation for transitioners (heat damage or relaxed) can literally make or break your transition. That line where new natural hair meets damaged is the weakest point along your hair shaft. It can break in the blink of an eye, and some of your hair will. I’ll say it again: some of your hair WILL break. Not because you did anything wrong, but because you don’t live in a dark bubble and never touch your hair. All naturals and transitioners suffer breakage, but the severity depends upon how you treat your hair. If you learn proper moisture techniques (click here for that info), and treat your hair like it is attached to a newborn baby that you’re trying to not disturb while sleeping (I’ll tighten that simile later), you won’t have to worry about excessive breakage and hair loss. At what rate does your hair grow? The average rate of growth is half an inch per month. Your hair may fall above or below that rate, and that is definitely a contributing factor to how long you should transition. Although variables will invariably (haha) enter the equation, you can always roughly guesstimate that to end up with 6 inches of new natural hair, you’ll need to transition for 12 months. What styling options are you looking for? If you’re one of those lucky gals who can protectively style for months on end, then your transition may be a little more seamless and can go on longer. For those that can’t (like me), determine what style options you’ll be comfortable with rocking. The more options you have, the longer you’ll be able to muster transitioning. Cut hair shrinks up a little more. I learned this lesson recently. I had gotten so used to my heat damaged ends elongating my hair, that when they were gone, the ends of my hair curled into themselves instead of just hanging down. So whatever length you think you want, go about half an inch or so past that point. How much patience do you have? Transitioning is literally a waiting game. Sure, you can do things like scalp massages, use essential oils, take vitamins, and work out to help accelerate hair growth and health. But they aren’t gonna give you 15 inches of growth overnight. The more patience you have with your hair growth process, the longer you can transition, and vice versa. Click here for a breakdown of what to expect//look for in your first year of transitioning. Do I Even Need to Transition? I Just Want My Curl Back…. A continuing theme in a lot of the e-mails I receive is an expressed desire for a curl or texture to return. Unfortunately, if your hair is damaged, that is not the case. There is no treatment you can do, no product you can buy that will make your curl return to you. Damage is damage is damage. Now, there is a caveat to this. Let’s say all along your hair has been healthy and textured, and you decide to flat iron it one time on a temperature that’s a wee bit too high. As a result, your coils don’t spring back to normal; they’re a little drab and stretched-looking. To help rehab your hair, you can pick up an intense restructurizing product like ApHogee 2-Step Protein Treatment. Even with protein and moisture restoring products, there is no guarantee that your hair will be as it was before. But if you’re a chronic straightener (like I was), or had a relaxer, neither of these treatments will do anything for you. Instead of wasting time and money on products that won’t do anything but disappoint you, focus on what is working well for the new curls coming in that are replacing the long gone ones. That banana clip wouldn’t stand a chance against these tresses. Heat damage occurs when utilizing heat styling tools (either one time or on a repeated basis) that are in fact too hot for your hair. Too-hot flat irons, combs, and curlers basically melt the protein in your hair, causing it to become weak, thin, brittle, and prone to breakage and splitting. 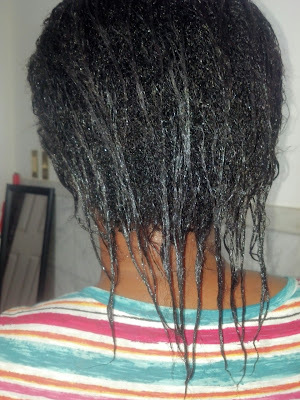 Because it is melted, your curl is gone, and it becomes difficult to absorb and retain moisture within the hair. Notice the difference between her natural hair and relaxed ends! Yours may not be as severe, but always remember: damage is damage is damage. Not to mention the scars, baldness, and burns! Relaxers cause a swelling of the hair cortex, separating protein bonds. The broken bonds realign themselves into a straight configuration. If it sounds a little unclear, click here. Jc does a beter job at breaking it down than I do – and she has pictures! Yeah, she’s white but you get the point. You see what those ends look like, and I’m sure most of her hair looks just as bad (not trying to be rude, just stating likely facts). 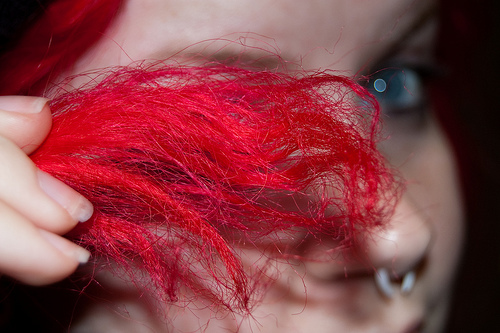 Hair color (especially bleaching, blondes, or lighter colors in general) works by lifting the cuticle, and dissolving the melanin that gives hair its color. Thanks to these raised cuticles, dryness, difficulty with moisture retention, weaker hair, and breakage is almost always on the menu, to some degree. Jc explains this one better to. Click here for that. So….I looked at the pictures and I have _________ damage. What do I need to do? Easy. Transition, chop, or wait until your hair decides for you via falling out/breaking (not recommended).